Fedir Krychevsky (Ukrainian: Федір Кричевський; May 22, 1879 in Lebedyn, in the Kharkov Governorate of the Russian Empire – July 30, 1947 in Irpin, in Kiev Oblast, in the Ukrainian SSR, Soviet Union) was an influential Ukrainian early modernist painter. He was the brother of graphic designer Vasyl Krychevsky. Krychevsky was born in Lebedyn to the family of a Jewish country doctor who converted to Orthodox Christianity and married a Ukrainian woman. He graduated from the Moscow School of Painting, Sculpture and Architecture in 1901 and the Saint Petersburg Academy of Arts in 1910. He traveled in Western Europe for a year, and studied briefly with Gustav Klimt in Vienna. He moved to Kiev, where he served as professor and director at the Kiev Art School from 1914–18. In 1917, he was one of the founders and a rector (from 1920–22) of the Ukrainian State Academy of Arts. When the academy was abolished, he worked as a professor at the Kiev State Art Institute, eventually becoming its rector. He remained in Kiev at the onset of the Second World War, and kept his position at the Institute, trying to save it in difficult conditions during the German occupation of Kiev. He served as the chairman of the Union of Ukrainian Artists that tried to improve the conditions of artists during the occupation. He was extremely popular among the artist-colleagues, faculty at the institute and the students, and no one betrayed his Jewish origins to the German authorities, saving him from the Babi Yar massacre. He moved to Königsberg in the summer of 1943, to join his brother Vasyl. He attempted to flee west to escape the advancing Soviet troops, but the train in which he was traveling was overtaken. Krychevsky was arrested by the NKVD as a collaborator, but his interrogations have elicited nothing that could incriminate him, so he was stripped of all his titles and honors and sent to internal exile to the village of Irpin near Kiev where he died of starvation during the famine in 1947, despite the food help that was receiving from his student Tetyana Yablonska. Twelve years after his death Krychevsky was "rehabilitated." In 1959 the first exhibition of his works was held in Kiev, and information about his work began to be published. In total, he produced close to a thousand works, including narrative compositions, portraits, landscapes, drawings. His early work remains the most valuable and appreciated part of his oeuvre. It was formed under the influence of Gustav Klimt and Ferdinand Hodler and combined Secessionist aesthetic principles with folk and Icon sensibilities. Krychevsky draftsmaship is considered to be equal to that of Adolph Menzel. His later work, although solid in execution, suffered from ideological constraints of Socialist Realism. 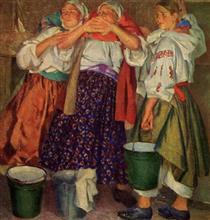 For 30 years Krychevsky was one of the leading figures in Ukrainian art. In 1911 and 1913 he organized the first strictly Ukrainian art exhibitions. 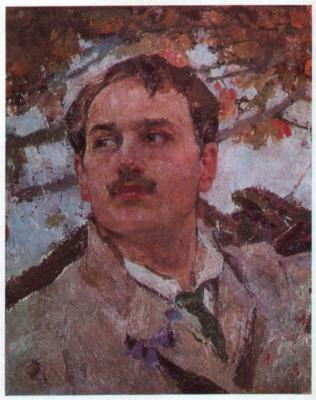 Beginning in 1897, his work was exhibited at over 34 shows in and outside Ukraine. He was also a successful teacher, whose students included many famous Ukrainian artists. 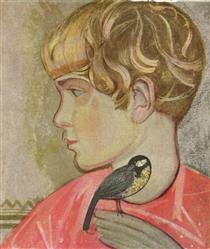 Boy with the Birdie Fedir Krychevsky ? 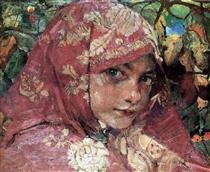 Girl's Head in a Shawl Fedir Krychevsky ?